These Vegan Mini Chocolate Hazelnut Pies have the pure essence of rich, sweet, chocolatey, and hazelnutty Nutella, but without the refined bleached sugar, palm oil, and artificial vanilla flavoring. The best part of this pie is inside of a buttery pie crust, we’ve got a silky smooth and creamy chocolate-hazelnut filling. And the best part? 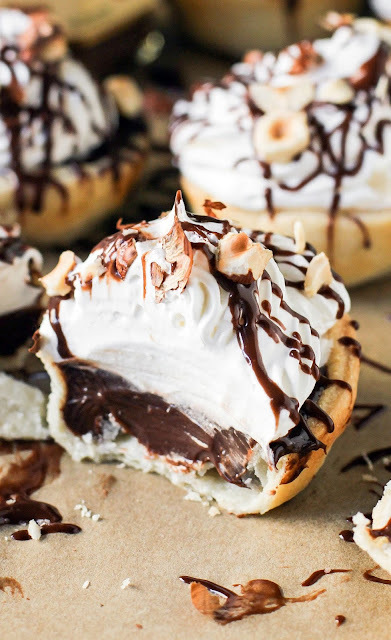 These are MINI Chocolate-Hazelnut Pies. Bring the rolled pie crust out of the fridge and let it sit at room temp for about 20 minutes, or until slightly softened (if you unroll it cold, it could tear). Unroll the pie crust onto a clean surface. Use a 4″ circle cookie cutter to punch circles out of the crust. In a large bowl, whisk together the coconut cream and melted chocolate. Whisk until completely smooth. Whisk in the Nocciolata, then whisk in the vanilla extract. Scoop the “batter” into the baked pie crust cups and transfer the pan to the fridge. Refrigerate overnight. Serve with coconut whipped cream, a healthy dose of melted chocolate drizzled on top, and a generous sprinkle of chopped hazelnuts. Enjoy! **Or, refrigerate an unshaken can of full fat coconut milk and scoop out a heaping ½ cup of the cream.